A congenital heart defect occurs at birth and it is the most common type of birth defect in newborns. This defect means there is a problem with the structure of the heart, involving either the walls of the heart, the valves of the heart, or and arteries and veins near the heart. The challenges are that this defect can obstruct the normal flow of blood throughout the heart, and can either make it slow down, go in the wrong direction, or be blocked completely. Many times, there are no signs or symptoms of this defect and children are diagnosed much later on in their life. Signs and symptoms include rapid breathing, cyanosis, fatigue, and poor blood circulation. Minor defects may not have signs or symptoms, while severe cases are diagnosed during pregnancy or soon after birth. This defect can also cause heart murmurs which are abnormal sounds in the heartbeat. For older children with this defect, they may get tired easily and feel shortness of breath when engaging in physical activities. To diagnose an infant with a congenital heart defect, doctors conduct physical examinations and do heart tests. When caring for babies with this defect, a pediatric cardiologist is involved to care for the child’s heart problem. This is a specialist who repairs heart defects by conducting surgeries. 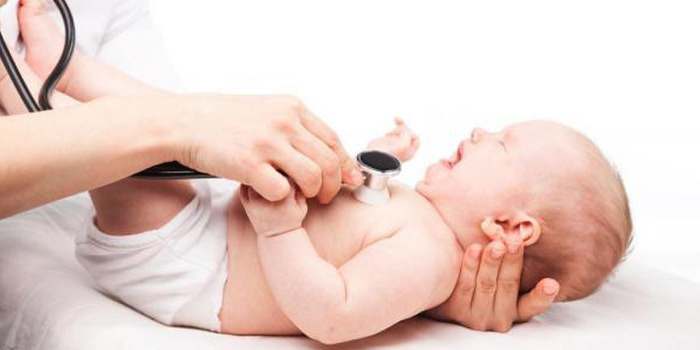 Physical examinations may also be done by doctors to listen to the child’s heart and lungs using a stethoscope. They can also look for signs previously mentioned such as cyanosis, which is a bluish tint to the skin, lips, or fingernails. Diagnostic tests include an echocardiography, EKG, chest x ray, pulse oximetry, and cardiac catheterization. An echocardiography is a painless test that creates a moving picture of the heart to monitor the sound waves and see if the heart is working properly. An EKG records the hearts electrical activity and shows how fast the heart beats. It also shows the strength and timing of electrical signals passing through the heart. A chest x ray looks at the structure of the chest, specifically the heart and lungs. A pulse oximetry attaches to the finger or toe and is a sensor estimating the amount of oxygen in the blood. Lastly, a cardiac catheterization is a flexible tube that is put in a vein in the arm, groin, or neck and is then threaded to the heart. This helps to repair some heart defects, and it can be used to see the blood flowing through the heart and blood vessels using an x ray image. To treat a congenital heart defect, treatments differ for each patient. Some may not need treatment at all, while others may need to be observed occasionally and visit their cardiologist. In more severe cases, surgery may be required or a cardiac catheterization may be needed to repair the defect. If a child is treated, their condition may worsen as they grow older and they may need further treatments in their adulthood. It is important to treat this defect as severe cases can potentially lead to heart failures if the heart is unable to pump enough blood throughout the body. How To Apply for Disability Tax Credit for Congenital Heart Defect?